Global seafood market is very interisting for some Indonesian businessman. 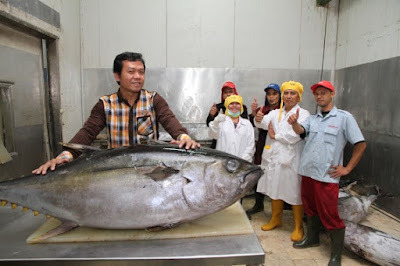 One among Indonesian company that now intens to develop international market is PT Tridaya Eramina Bahari, which is one of Indonesian fishery exporters. Tridaya, the company was founded by Dayat Suntoro. Currently Tridaya able to export at least 7 containers monthly. Fish products that are exported not only the type of sea fish, but also certain fish from aquaculture, particularly catfish. Before starting up his own businesses, Dayat had worked for a Japanese entrepreneur for 5 years, from 1988 to 1992. From there he learned entrepreneurship. Dayat father has already preparing him to become entrepreneurs. Then, in 1994 he decided to build their own business, under the name of PT Tridaya Eramina Bahari. Capitalized by the trust from his acquaintance, then he got a buyer from Japan.